Join us for a journey through the traditions, history, legend, handicrafts and gastronomy of a part of Mexico that is off the beaten track, unspoiled, and full of culture. As we depart Puerto Vallarta, the roads will weave into the Sierra Madre mountains, and open up into varied countryside and rural areas. We'll stop for a traditional Mexican breakfast at the working rancho of La Estancia, where you'll sample the local foods and famous San Sebastian coffee. After breakfast, we'll make our way to the small colonial town of Mascota (founded 1592), where we'll explore the cobblestone streets and visit the main plaza, the unfinished Precious Blood church, and the Parish church of Our Lady of Sorrows. We'll stop next at the chapel of The Cross of Romero, where panoramic views of Talpa de Allende await. 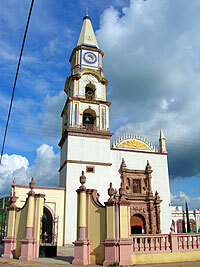 Here we'll reveal the history of this amazing town, founded in 1599, where the miraculous Virgin of El Rosario attracts thousands of pilgrims and visitors from all over Mexico to offer their thanks for a favor or miracle they have received. Once in the beautiful village of Talpa, we'll visit such famous landmarks as the town cemetery, the Municipal Presidency, St. Joseph Temple, the Main Church of Our Lady of Rosary, and the sacred museum of Our Lady of Talpa. After a visit to the scenic monument of Christ the King, we'll break for a delicious lunch at a view restaurant overlooking the town before heading back to Puerto Vallarta. A full day of culture, sightseeing, and exploration of the wonders of colonial Mexico. Runs: Wednesday and Friday at approximately 8:00 AM, November 1st through June 15th only. This tour does not operate during the rainy season. Departs From: Your hotel front door (in most cases). Exact pick-up time and instructions will be included with your confirmation. You'll Need: Camera, Comfortable walking shoes, sunscreen, hat, long pants, extra money for shopping or additional drinks.